Eating leafy vegetables has many health benefits but sad to say, not everyone is fond of eating vegetables. Filipino by nature are meat lovers especially kids. But you can make them eat leafy vegetables by incorporating them in pasta. Like the malunggay pasta I have here. 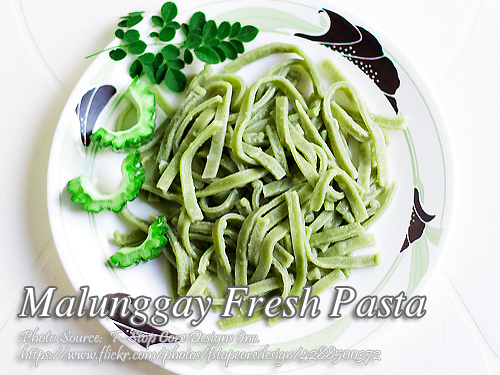 You can mix the malunggay leaves in making pasta. You can also adjust the amount of malunggay by using only 1 cup if you want lessen the taste of the leaves and only specks of green on your pasta. To make malunggay fresh pasta; Place eggs, corn oil, malunggay and salt in a blender and puree. Place flour in a bowl and form a well. Pour in the malunggay mixture. Mix thouroughly. Dough should not be too sticky or too dry. Add a little bit of water to the dough if it is too dry. Kneed gently for about 3 minutes. Once done, wrap dough in plastic wrap and refrigerate for 30 minutes. Using a rolling pin, roll out the dough until just thin enough to run it through the pasta machine. Start by running the dough through the pasta machine using the thickest setting possible. Place flour in a bowl and form a well. Pour in the malunggay mixture. Mix thouroughly. Dough should not be too sticky or too dry. Add a little bit of water to the dough if it is too dry. Kneed gently for about 3 minutes. Once done, wrap dough in plastic wrap and refrigerate for 30 minutes. Using a rolling pin, roll out the dough until just thin enough to run it through the pasta machine. Start by running the dough through the pasta machine using the thickest setting possible. Pass the dough twice twice in the same setting while occasionally dusting the rollers of the machine and the dough with flour to prevent sticking. Run the dough through a thinner setting until you reach the desired thickness, which is usually the thinnest possible setting. Cut the rolled out dough into spaghetti or fettucini using the proper setting in the pasta machine. Cook pasta in salted boiling water for about a minute or two. Serve with your favorite healthy pasta sauce.